Welcome to Hudson Saw & Tool! 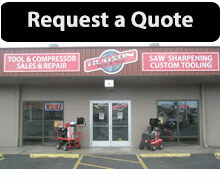 We have a long history in Southern Oregon for providing hand and stationary tools service. We started off as Cal-Ore Carbide serving the lumber industry in 1962 with saw sharpening and over the years we’ve expanded our product line to offer more products and services. We are now the authorized pressure washer dealer for Southern Oregon, serving Medford, Grants Pass, Ashland and Klamath Falls with sales and on-site service and repair. Hotsy is known for industrial hot water power washers used by professionals in agriculture, manufacturing, transportation, contract cleaning and construction. We’d be happy to provide an on-site demo if you’d like to know more about these tough and durable pressure washers. Our trained technicians make on-site calls for stationary tool repair and pressure washer repair. We rent pressure washers and power tools. Call today to learn what products are available. We’ll come to your business and demonstrate a pressure washer. There’s no obligation - call now to set up a time.